How does it bind to the promoter? How does it unwind the DNA? How does each component of the enzyme contribute to this synthesis? After the RNA polymerase binds tightly to the promoter DNA in this way, it opens up the double helix to expose a short stretch of nucleotides on each strand . Unlike a DNA helicase reaction , this limited opening of the helix does not require the energy of ATP hydrolysis. Instead, the polymerase and DNA both undergo reversible structural changes that result in a more energetically favorable state. Interaction of the σ subunit with a promoter signals the polymerase to initiate transcription at a specific sequence in template DNA. The β and β′ subunits polymerize ribonucleoside triphosphates (NTPs) as directed by the template strand. The α subunits interact with regulatory proteins and, in some cases, with DNA to control how frequently RNA polymerase initiates transcription from a specific promoter. But that's all that I have found. Where can I find a full length explanation about this with proper diagrams(if possible)? P.S. Has the mechanism not been fully discovered? I have found an article which describes all the major steps of the mechanism of working of RNA polymerase II. Since the article is too long, I'd rather put the main points here. You can read the complete article here. Since putting the whole answer under blockquote would be inappropriate, I am just putting the main points with the reference at the bottom. Remember, this is not the complete article, this is just the summary for the ones who can't read the full article from NCBI or who don't have time or access to do so. Pol II transcription typically begins with the binding of gene-specific regulatory factors near the site of transcription initiation. The core promoter serves to position Pol II in a state termed the Preinitiation Complex (PIC) analogous to the bacterial Closed Complex. In this state, Pol II and the general factors are all bound to the promoter but are not in an active conformation to begin transcription. Next, a dramatic conformational change occurs in which 11–15 base pairs of DNA surrounding the transcription start site are melted and the template strand of the promoter is positioned within the active site cleft of Pol to form the Open Complex. After synthesis of about 30 bases of RNA, Pol is thought to release its contacts with the core promoter and the rest of the transcription machinery and enter the stage of transcription elongation. 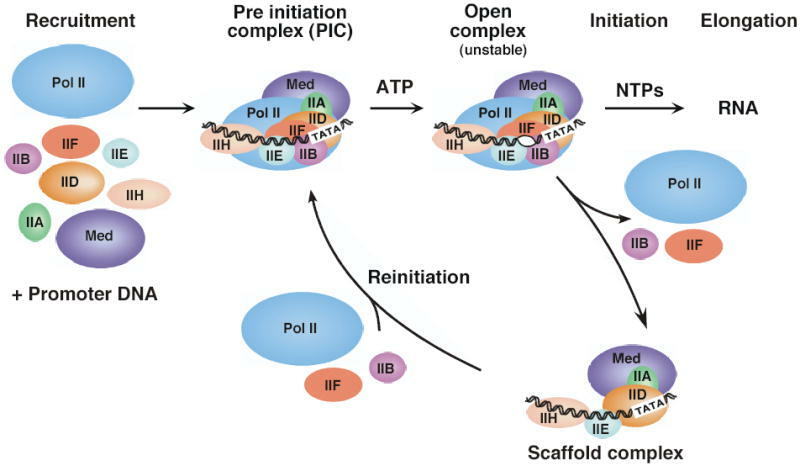 Factors that promote productive RNA chain synthesis, RNA processing, RNA export, and chromatin modification can all be recruited to elongating Pol II. Sequence elements found in core promoters include the TATA element (TBP binding site), BRE (TFIIB recognition element), Inr (initiator element), and DPE (downstream promoter element). The core domain of TBP consists of two imperfect repeats forming a saddle shaped molecule that binds the widened minor groove of an 8-bp TATA element, unwinding about a third of a helical turn and bending the DNA about 80 degrees toward the major groove. Biochemical studies elegantly showed that TBP does not bind to TATA elements with high orientation specificity, leading to the finding that other promoter elements in combination with TATA determine the orientation of transcription machinery assembly at a promoter. The other two core promoter elements with proven function, Inr and DPE likely serve as binding sites for the TAF (TBP Associated Factor) subunits of the general factor TFIID. The role of TBP at TATA-less promoters: From biochemical studies of the yeast HIS4 promoter, mutation of the TATA to a GC-rich sequence allowed recruitment of the transcription machinery to a promoter at a reduced level, but transcription initiation was completely abolished. These results demonstrate that at one class of promoter, assembly of the transcription machinery into a productive complex requires that TBP bind the TATA element as seen in the crystal structure. Although TBP has tremendous flexibility in the ability to bind variants of the TATA sequence, not all sequences are compatible with TBP binding. TFIIA and TFIIB are the two general factors that interact specifically and independently with TBP. TFIIA stabilizes TBP-DNA binding and strongly promotes binding of TFIID to DNA through an anti repression mechanism by competing with the TAF1 N-terminal domain (TAND) that occludes the DNA binding surface of TBP when TFIID is not bound to DNA. TFIIA can also compete with the negative regulatory factors Mot1 and NC2 to promote TBP binding in vitro. The TAFs function in promoter recognition as well as in positive and negative regulation of transcription. A subset of TAFs has DNA binding activity and at least one TAF has the ability to bind acetylated nucleosomes, protein acetylase, and ubiquitylation activity. A core of 5 TAFs are found in both TFIID and the acetylase/coactivator complexes. Pol II subunits can be classified into three overlapping categories: subunits of the core domain having homologous counterparts in bacterial Pol (Rpb1, 2, 3, and 11), subunits shared between all three nuclear polymerases (Rpb5, 6, 8, 10, and 12), and subunits specific to Pol II but not essential for transcription elongation (rpb4, 7, and 9). Pol II structure: Pol II is composed of four mobile elements termed Core, Clamp, Shelf, and Jaw Lobe that move relative to each other. The Core element accounts for about half the mass of Pol II and is comprised mainly of subunits common to all cellular Pols. At the center of the enzyme is a deep cleft where incoming DNA enters from one side and the active site is buried at the base. This cleft is formed by all four mobile elements and has been observed in both closed and open conformations in the 10 subunit enzyme. The Shelf and Jaw Lobe elements move relatively little and can rotate parallel to the active site cleft. The Clamp element, connected to the Core through a set of flexible switches, moves with a large swinging motion of up to 30 Å to open and close the cleft. The Pol II CTD molds itself to a binding partner: Pol II undergoes regulatory phosphorylation and dephosphorylation as part of the transcription cycle with the Rpb1 C-terminal domain (CTD) the target of this modification. The CTD, which is unique to Pol II, contains 25–52 repeats of the tandemly repeated heptad sequence YSPTSPS, with both Ser2 and Ser5 the sites of phosphorylation. The CTD acts as a platform for assembly of factors that regulate transcription initiation, elongation, termination, and mRNA processing. New structures of CTD interactions with two different binding partners have revealed that the CTD appears to mold itself to its binding partner, adopting different conformations. In one study, a complex of a single copy of the CTD with Ser2, 5-P bound to the Pin1 peptidylproline isomerase was solved. These studies showed that the transcription machinery makes extensive interactions with promoter DNA between positions −43 and +24 with respect to the transcription start site. Two RNA Pol II subunits (Rpb1 and 2) make extensive DNA interactions over 60 bp. TFIIB and the small subunit of TFIIF (TFIIF$\beta$) both interact with DNA on either side of the TATA and the large TFIIF subunit interacts with DNA downstream of TATA. TFIIE interacts with promoter DNA just upstream of the transcription start site while the TFIIH helicase subunit interacts downstream and possibly upstream of the transcription start. Pol II and TFIIF interact over an extended surface: TFIIF binds Pol II as a heteromer and contains two subunits that are conserved among human, insects and yeast, termed Tfg1 and Tfg2 in yeast (Rap74 and Rap30 in humans). The N-termini of both conserved subunits form a dimerization domain and the C-termini of both subunits are winged helix domains. The structure of Pol II with the Tfg2 subunit alone implicated Tfg2 binding to the extended clamp region and Tfg1 binding to Rpb4/7. Transcription start site selection: At TATA-containing promoters in vertebrates and Drosophila, the transcription start site is located about 30 bp downstream from the beginning of the TATA sequence. A model to explain the transcription initiation site in higher eukaryotes would be that TFIIB binding to both Pol II and promoter DNA sets the distance needed for the DNA to travel from the TFIIB binding site on Pol II to the active site of the enzyme. Not the answer you're looking for? Browse other questions tagged biochemistry molecular-biology transcription book-recommendation or ask your own question.